Vintage Clothing Blog | Vintage Wedding Dresses | Salvage Life: RUSSEL CROWE WOULD BE PROUD! RUSSEL CROWE WOULD BE PROUD! So, I have a pair of brown leather gladiator sandals, but I still find myself scouring the internet for hours looking for another pair. I just love the contrast of a rough masculine sandal with a flowing floral dress! On my unnecessary search, I found these four pairs that unfortunately, are not my size. So, I am hoping that one of you, my readers, may be able to provide a loving home for these beauties. Can you believe these fabulous shoes are only $20?!!!! If you are a size 6, you should snag them before they are gone. The are available from Etsy seller mariemars. 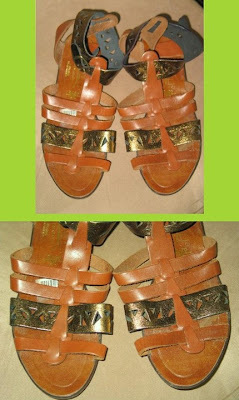 These deadstock 80's sandals with tags still attached are available from Ebay seller Mademoiselle*Vintage. Size 8. Auction closes on May 28, 2008. Size 7, black closed toe gladiator sandals from my favorite seller IndieCultVintage. These might be the BEST GLADIATOR STYLE SANDALS I HAVE SEEN ALL SEASON! Size 7 from Ebay seller thevintagedistrict. Available until May 25th, 2008.